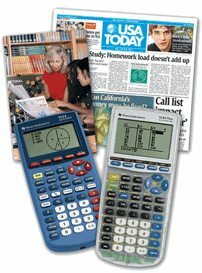 These free online educational science resources integrate USA TODAY content with Texas Instruments technology. The lessons are dedicated to engaging students in timely, relevant, real-world information integrated with TI graphing technology. Each lesson was written by experienced science educators and is based on USA TODAYs articles, signature Snapshots® and infographs. The Science TODAY activities have been specifically designed to explore topics in Earth science, biology and physics. The lessons are correlated to National Science Standards. Students will examine and evaluate data on the corn harvest in the United States over the past several years. The USA TODAY Snapshot “Breast cancer risks” shows the percentage of women in several age categories that, statistically develop breast cancer. Using the Snapshot™ “When the snow is a high as an elephant”, students will examine the potential effects of accumulated snow.